Herbal ginseng exists as three distinct varieties: Oriental, American and Siberian. Oriental, or panax ginseng, is grown mainly in China and Korea, where it is harvested for its roots. Chinese ginseng root is dried naturally and turns a whitish color, whereas Korean ginseng root is treated differently and turns a reddish color, which is why it is sometimes referred to as "red panax." The Siberian variety is not truly ginseng, but rather a distant cousin to the panax types. All ginsengs are used medicinally, usually in efforts to boost energy and enhance vitality. Consult your physician before beginning to take any new supplements. Ginseng has been used for countless generations, especially within the protocols of traditional Chinese medicine. 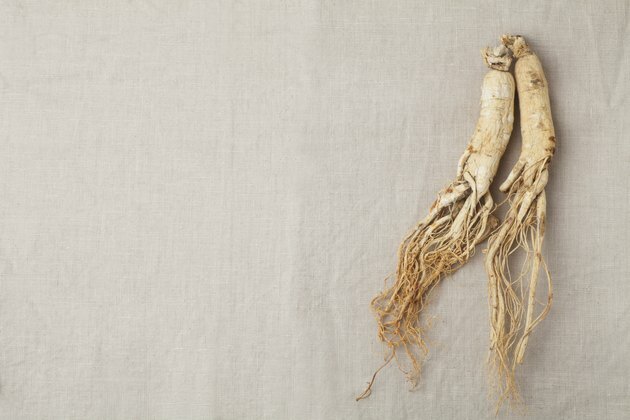 The name originated in China and means "man plant," because Ginseng root resembles the human form, as cited in "The Complete Book of Chinese Medicine." The ancient Greeks later added the Latin prefix panax, which was derived from the word panacea, or "cure-all." Both ancient cultures relied on ginseng root to alleviate a variety of conditions, but it was viewed mainly as a tonic to increase vitality. Siberian ginseng is grown mainly in eastern Siberia and was labeled as a ginseng in modern times mainly for marketing purposes. Korean ginseng is considered the most potent and popular variety in the world, with an estimated 6 million American users who have tried it at least once, according to "The Way of Chinese Herbs." In traditional Chinese medicine, red panax is believed to stimulate yang energy, which improves circulation, increases blood flow, revitalizes the body and aids recovery from weakness after illness. In Asia, red panax is regularly taken to increase vitality and stamina, improve work efficiency, combat fatigue, strengthen the immune system and enhance libido. In Western countries, it is taken more sporadically as an energy booster, although a review article published in a 2005 edition of "Phytotherapy Research" concluded that herbal adaptogens, such as ginseng, may benefit people diagnosed with fibromyalgia, chronic fatigue syndrome, depression and Alzheimer's disease by reducing pain levels, boosting energy and cognition, and restoring sleep cycles. Korean ginseng is harvested after six years, at which time it is steam-cured before drying. This process produces reddish-brown roots and preserves the plants active compounds, called ginsenosides. The main difference between Korean and Chinese ginseng is potency. Chinese ginseng has milder energy boosting effects, so it is thought to be better suited for young children, the elderly and the very ill, as cited in "Chinese Herbal Medicine: Materia Medica." Chinese ginseng is mainly produced in Manchuria and is usually white in color, because the roots are dried in the sun. The drying process breaks down enzymes, which reduce the root's potency. It is grown for four to six years before it is harvested. Siberian ginseng, or Eleutherococcus senticosus, is not actually ginseng, but rather a different species that was renamed as a ginseng most likely for marketing purposes and to boost sales. The Siberian variety has woody roots instead of fleshy ones, and they contain eleutherosid compounds instead of ginsenosides, as cited in "Medical Herbalism." Eleutherosides are different types of adaptogens, although they still have energy boosting properties. Siberian ginseng is less potent than the Asian varieties, especially red panax, and not nearly as well studied.